Ceres Gallery will present Beneath the Same Sky: From Oaxaca’s Central Valley to the Rooftops of New York, paintings by Elizabeth Downer Riker, September 5 through September 30, 2017. In conjunction with the exhibit, there will be a panel discussion, “Rooftop Farms: Greening the Concrete Jungle,” at the gallery on September 13 from 7 to 8:30 pm. Both events are free to the public. Beneath the Same Sky reveals commonalities between two vastly different cultures through the depiction of agricultural labor. Riker’s oil on canvas works depict indigenous farmers working the fields in an ancient village in southern Mexico and metropolitan New Yorkers farming on the city’s industrial rooftops, a pioneering form of urban agriculture spreading in cities across the globe. 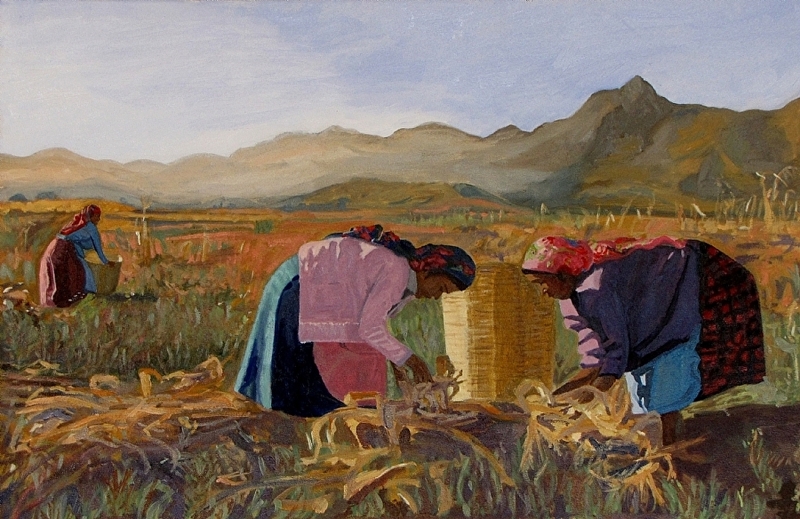 Though worlds apart, the subjects of Riker’s paintings are linked by the same small-scale, labor-intensive work where a successful harvest depends on a knowledge of and respect for the unique needs of the land, be it a communally-owned plot tilled for generations or crane loads of soil deposited on top of a warehouse. The artist, born in Boston and raised in Paris, started out as a filmmaker, studying at NYU’s graduate film program. After discovering her love for painting, she studied at the Art Students League in Manhattan. She lived for many years in the Central Valleys region of Oaxaca, where indigenous communities, insulated by rugged terrain, have succeeded in retaining their cultural traditions and customs into the modern age. Over time, Riker developed a close relationship with the villagers of San Bartolomé, and was invited to accompany them with her easel as they worked the land. Just as she was to drawn to their labor in the fields, many of the village children were intrigued by her work at the easel, culminating in a series of art workshops which she organized for village youth. Riker returned to New York still passionate about the theme of people working the land, and found a new subject here—on the city’s rooftops. The rooftop farmers are inspiring to her, not only as a subject for her work, but also because they offer a hopeful vision for a greener future and are creating new opportunities for people to connect with nature in an increasingly urbanized world. Ceres Gallery promotes contemporary women artists, supports diverse artistic and political views, and encourages risk-taking by artists in all disciplines.